Discover the exercises that matter! Ease aches...sleep better...stay mentally sharp...increase stamina...and add years to your life! You can access Starting To Exercise on your smart phone, tablet or desktop computer. 41 exercises that will fight aging...boost your health and vitality...and keep you looking and feeling years younger! All exercise is good, but some exercises are better than others. These are the exercises that will make a measureable and lasting difference in your health and longevity. These are the exercises you’ll meet — and master — in Starting to Exercise, the online course from the doctors and wellness experts at Harvard Medical School. This valuable program highlights forty-one exercises that together will help you achieve greater overall fitness. It includes aerobic workouts for better cardiovascular health, strength training for your bones and muscles, plus essential balance and flexibility exercises. You’ll learn how to get the most out of each exercise...how to “amp up” the challenge...how to measure your performance...and maintain your motivation. Every exercise is illustrated and fully explained with helpful tips and techniques for maximizing the exercise’s benefits. You’ll learn the recommended number of sets and reps, and how to tailor the exercise to your schedule or level of fitness. You’ll find a course that’s easy to navigate! Designed to make the most of your time and effort, Starting to Exercise makes it a snap to find specific exercises, to pause a video, go back to repeat a routine, or speed ahead to a new workout. 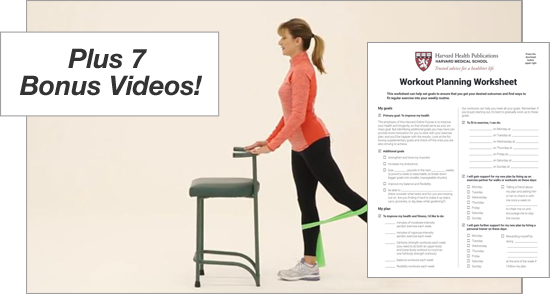 PLUS, Starting to Exercise contains instructive videos in which master trainers demonstrate the proper technique for exercises including stationary lunges, hip extensions, and an everyday cardio workout...AND, you’ll also find a downloadable exercise planning worksheet, week-by-week training guides...tips for exercising safely, for keeping workouts fresh and fun, and much more. So, get moving! Order Starting to Exercise today. The full online course is yours for just $29.95. That’s a savings of $10.00!